Annandale Design was appointed by contractors McLaughlin & Harvey to design, manufacture and install the complete metalwork package at the new £53m Kilmarnock College Campus, part of Ayrshire College. An extensive project based in Annandale Design’s local community began in August 2015, reaching completion in May 2016. Kilmarnock College Campus provides an innovative learning space with the latest facilities for students, organisations, employers and the community. As part of Ayrshire College it offers a wide variety of courses, events space and sport facilities as well as a state-of-the art restaurant and beauty salon both run by students. 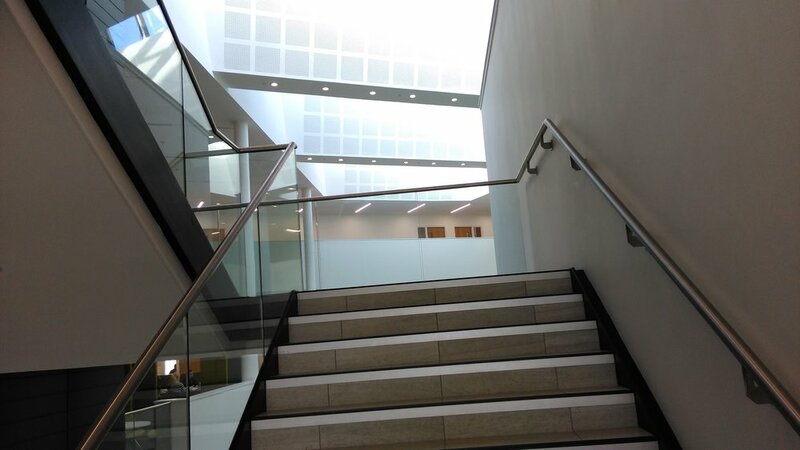 · Structural glass balustrades to the internal atrium space over 3 floors. Annandale Design was continuously responsive to meet the demands of such a large and complex project. Through working diligently and efficiently we were able to reduce lead times with minimal carriage and reduce haulage costs. The result of the project was both a fantastic end result in terms of the build, with the building looking slick, contemporary and an exciting place for young people to learn and develop. This was a great opportunity to showcase our quality and expertise to the local community. Since 2011, Annandale Design has been working closely with leading property, residential, construction and services group Kier Group at their Hawkhead Village site in Paisley, Glasgow. Annandale Design was delighted to be appointed by PosterPlus Ltd to complete a project which included the design, fabrication and installation of their outdoor digital advertising display at their latest advertising location in Coatbridge, Scotland. Annandale Design was appointed by Bowmer & Kirkland, a family company offering a wide range of specialisms from construction related services to homeland security products, to carry out the design, manufacture and installation of a significant specialist metalwork package for one of the largest oil and gas companies in Dyce. Annandale Design was commissioned for the manufacturing of 25 carousel sides for an offshore wind farm off the coast of Wales. Annandale Design has completed a contract to supply stainless steel bends to a major player in the oil and gas industry's offshore rig project. In 2015, contractor CBC appointed Annandale Design to carry out a project at the proposed £2.7million Shield Centre. In September 2014, Barony Universal Products appointed Annandale Design to carry out specialised work and alterations to their Irvine office space. LendLease commissioned Annandale Design in January 2014 to undertake a substantial metalwork package to Strathclyde University’s Technology Innovation Centre, in Glasgow. In February 2015, Annandale Design were appointed by contractor DMC, to carry out a crucial rail project at Hamilton Square Station in Birkenhead, Liverpool. Miller Construction, the main contractor of the project, employed Annandale Design to carry out the design, manufacture and installation of a number of significant high profile specialist metalwork package for Union Square Shopping Centre. Annandale Design was appointed by M & J Ballantyne Ltd, in May 2014 to embark on a project for the newly designed Kelso Business Hub, in the Scottish Borders. Leading high-end re-fit company Harrison Jorge commissioned Annandale Design in July 2014, to carry out a number of bespoke projects for their London client, Britain’s first retail High Street bank. In May 2014, Morgan Sindall Group appointed Annandale Design to complete work on their Ullapool housing development. Annandale Design was employed by Spie Matthew Hall, in August 2014 to carry out alteration work at St Andrew's and St Brides Secondary School in East Kilbride. Appointed by Ereconomics Construction Ltd, this was a challenging project to be completed for the Easter holiday period and to strict specifications due to the corrosive environment of the pool area. Annandale Design has completed a major metalwork package for EDF as part of an upgrade programme at one of its nuclear plants. In July 2013, Morgan Sindall, one of the leading UK construction and regeneration groups, appointed Annandale Design to carry out a full metalwork package at Edinburgh’s main rail outlet, Haymarket Station.